We are a team of experienced paranormal investigators, we help individuals and businesses with a completely free service and advice, if they have a problem haunting or simply want to find out more about the activity they may be experiencing. We bring a scientific common sense approach to our investigations and always look for the non-paranormal explanations first. We take take client confidentiality very seriously and we do not share any information about our investigations with others without full client consent. Are you trying to raise funds for your charity or non-profit group please contact us we can organise a "Ghost Hunting Event" for you. We are also happy to organise events for pubs, clubs, hotels or other venues! Meet at The Old Sun Hotel at 8pm ( Hunt lasts aprx 21/2 to 3 hours) only £10 per person. Please book in advance numbers are strictly limited. 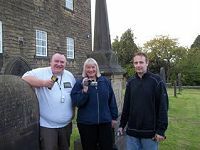 Ghost Hunts are run throughout the year at various venues, and on a regular basis in the Haworth area (please see website for more details). Private parties and groups can be catered for please contact us with any questions or for more information.